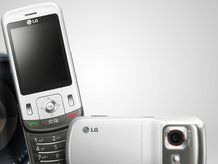 LG might have conceded the title of 'world's thinnest 8MP cameraphone' when the recently unveiled Samsung M8800 Pixon emerged, but it has bitten back with the forthcoming release of the KC780. With the Pixon coming in at 13.8mm thin, LG has said 'Pah!' to such a chassis, stating its new phone will pack an 8MP snapper in a 13.7mm frame, to be announced later this month. We haven't been able to confirm reports that consumers the world over are set to be amazed and possibly dumbfounded at the difference in sizes. Not a lot else has been revealed about the phone, which was (apparently) leaked in a recent press shot, and all LG has said is it will be a "great on-the-go companion for taking portraits." Which is what we've all been waiting for, really.